How did you come to be head gardener at Pashley Manor? I started here in 1995 as a 15-year-old looking for a job in the school holidays. I loved it so much that after college I came here to work full time. After a couple of years as deputy head gardener, I became head gardener at the age of 22. What are the main jobs you’ll be tackling in April? The early part of April is focused on tidying the spring borders. Because the borders are full of tulips it’s quite a slow, delicate task to weed, tidy and add fertiliser around the perennials and shrubs. After that it’s predominantly preparing for the festival and making sure we can accommodate the volume of visitors we get during that time. What other garden highlights are there this month? Although the bulk of the daffodils flower in March when we’re not open, we also have a lot of plantings of later-flowering narcissi, such as ‘Pheasant’s Eye’. They bring that last bit of early spring through into our open season. And, depending on the weather, the wisteria might be in flower on the back of the house. 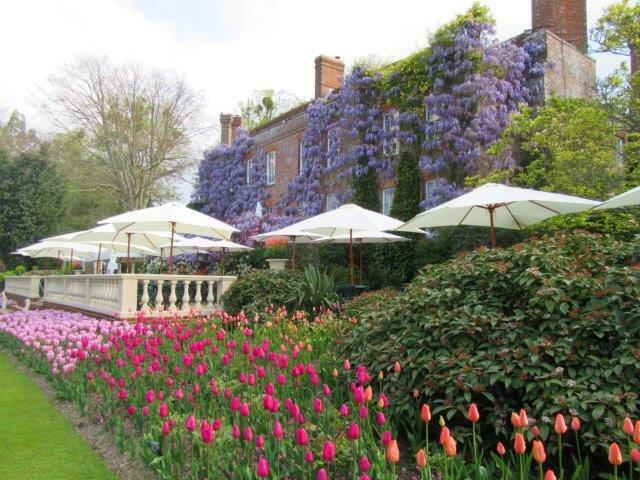 If it’s flowering at the same time as the tulips it’s a really stunning view, with the tulip borders below and the whole of the back of the house dripping with wisteria flowers. How do you plan for the tulip festival? We’ve planted 30,000 tulips each year for the past couple of years, but this spring, with the redevelopment of some of the borders, there’ll be about 40,000. So, 2018’s display should look spectacular. We can’t leave them in the ground because we’ve got summer plants to put in, such as the 1,500-2,000 dahlias for our late summer Dahlia Days show. We treat the tulips as annuals. Also we want fresh bulbs so we can guarantee they’ll all flower and it allows us to change the planting designs every year. So we lift them all and donate them to nursing homes, hospices and schools. Some are often replanted in local village greens. Do you have a favourite tulip? We grow about 112 different tulip cultivars, but my favourite ever since I started gardening is ‘Abu Hassan’ (below). I just love the colour combinations – rich mahogany red with golden edging. Are there any other special projects planned for 2018? There are some borders with old plants in them, and these plants can’t be cut back. They’re big plants, though, so we need a mini-digger to get them out, which makes it a lot of work to completely renew a border. So, rejuventaing one of these borders will probably be an autumn or winter project this year. ● OPEN 31 March-29 September, Tues-Sat plus Bank Holidays and special events, 10am-5pm. Tulip Festival open daily 24 April-8 May.